Every player must learn proper footwork to become a good player. He/she must learn how to execute the jump-stop, forward and reverse pivot, and make certain cuts without the ball, such as the V-cut. He/she must learn the "triple-threat" position. Here are drills that have the players execute these moves. See also: Footwork, Jump-Stop, Offensive Tips, and Cutting and Faking. See this clip from "Seth Greenberg: Practical Coaching Advice and Special Situations". Refer to the diagram. The players form two lines, one for the passers and one for the movers- shooters. 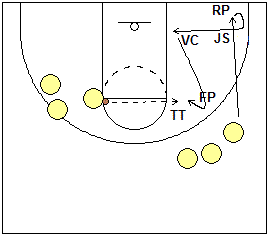 Start the drill with the player in the line on the right wing cutting sharply toward the corner, where he makes a jump-stop (JS), and then does a reverse pivot (RP), and then cuts to the block. There he makes a V-cut (VC) back out to the elbow or free- throw line extended area. There he does a forward pivot (FP) and receives the pass in triple threat position (TT). Finally, he takes the shot, follows his rebound, gets the rebound and passes to the next person in the passing line who does not have a ball. He follows his pass to the rear of the passing line. The passer goes to the rear of the shooting line. Make sure the jump-stop and pivots are executed correctly. Stress the footwork in this drill. Hop and land on both feet simultaneously. After the jump-stop, pivot on the inside (left) foot toward the open floor. Plant the inside (right) foot and push off it hard extending your left leg the opposite direction to make the sharp cut to the free-throw line extended area. At the end of the V-cut, make a sharp forward pivot by pivoting on the baseline (right) foot, and face the passer and receive the pass in triple threat position. At first, go through the drill slowly with the players, instructing and executing each move for them. Have the players go slow-motion at first, then speed it up once they start becoming proficient. Running this drill for 5-10 minutes each practice will rapidly improve these basic footwork skills. This drill teaches a few things at once, the jump-stop, reverse pivot, and crisp passing. It starts with 4 lines, a ball at the front of each line. The 4 lines begin in 4 corners of a square, about 25 feet apart facing each other. On the whistle, all 4 lines speed dribble toward each other with a target near the top of the arc. All 4 players jump-stop about 3 feet before they collide (forming a small circle) and reverse pivot to face the line to their right or left (decided prior to whistle), and make a chest pass to the person at the front of the line. Passers go to line they passed to and next 4 players go as soon as they receive the ball. Timing is important so that all 4 lines are passing, jump-stopping, and beginning at the same time. When this drill is running smoothly it looks like a dance but and when the timing is bad, it looks like chaos. After 20 passes or so, call switch and they pivot/pass the opposite direction. This drill is good for teaching the jump-stop and reverse pivot and it makes them think a little bit too.